I was able to see this film twice many years ago at a French Film Festival here in Manila and I feel I have to stand up for this film. Admittedly the film is ultimately slight, neither very dramatic or romantic. It does not engage its audience in any profound way. Nor does it have any deep insights. However, my lasting impression of "Mademoiselle" is its sense of overwhelming sadness, a feeling that you are living through something very special, an experience that will soon pass out of your life and that you will never regain. This sense is highlighted by the two scenes that bookend the film, which show Claire (Sandrine Bonnaire) in her car looking at the show poster, and then at the end driving away. The specific scene from the film that I have never forgotten is a brief one in which Claire and her would-be lover Pierre (Jacques Gamblin) take a ride across the city on a borrowed motorcycle. 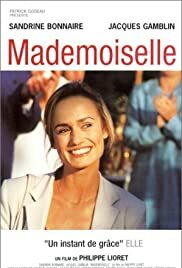 One reviewer has commented that Sandrine Bonnaire's face reflects happiness very well and this quality is well used in this scene where she communicates her sheer joy at being in love and alive at that particular moment. Many of the specific details of the movie have already faded from my memory but I still remember that scene even after all these years. In relation to this, I also remember a brief scene near the end when the counter girl calls Claire "mademoiselle" (miss), an indicator of how her one-night romance has brought her joy and, if only fleetingly, restored her youthfulness. If only for this sense of sadness, Mademoiselle remains one of my fondness movie-going memories and one of my favorite romantic movies. It is a reminder of how transient moments of true magic are in our lives when weighted against the mundane routine of "real life".